Anxiety and uncertainty gripped Texans in 1942. Thousands of families waved tearful goodbyes to fathers, brothers, husbands and sons who were among the three-quarters of a million Texans who served in World War II. On the home front, rationing was a way of life, with stamp books required to purchase meat, sugar, coffee, shoes, auto parts and gasoline. Hard times. In Austin, executives of the Game, Fish and Oyster Commission decided to publish a monthly magazine and sell it by subscription: 50 cents a year for Texas residents and $1 for out of state. 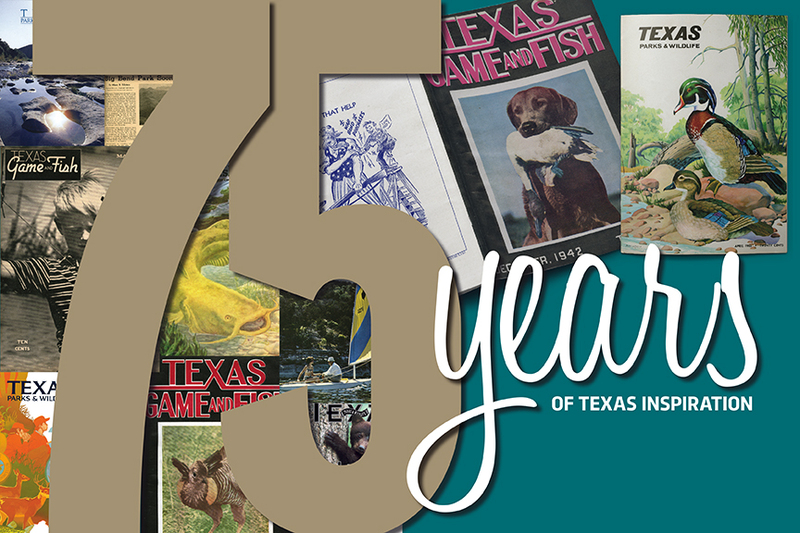 The first issue of Texas Game and Fish magazine hit the mailboxes of 6,422 subscribers in December 1942. A color photo of a hunting dog graced the cover; black-and-white photos illustrated the articles inside. Executive Secretary William J. Tucker’s editorial in the premier issue expressed optimism and set goals for upcoming issues. Seventy-five years later that magazine, now Texas Parks & Wildlife, continues to offer readers ways to enjoy “the invigorating influence of the out-of-doors.” Hiking, birding, mountain biking and profiles of Texas state parks join hunting and fishing articles on these pages in modern times. Texas Game and Fish occasionally stepped beyond the usual fare of hunting and fishing while still focusing on “the invigorating influence of the out-of-doors.” A 1943 article titled “Big Bend Park Soon a Reality” reported that the dream many Texans had about the Big Bend country along the Rio Grande becoming a national park was approaching realization. Articles about nongame wildlife featured bats, owls, the Mississippi kite and rare birds of the Rio Grande Valley. The April 1957 issue’s “Wildflower Time in Texas” advised: “Texas wildflowers can supply the fisherman with the needed enticement to get his family outdoors with him in the spring. While Dad and the boys fish, Mom and the girls can enjoy nature’s exquisite blossoms.” Times have changed. Joan Pearsall went to work for Texas Game and Fish magazine in 1958. All Austin employees of the Texas Game and Fish Commission were housed in the Walton Building at that time. The magazine delivered another change to readers in October 1965: color photos on the inside pages. For the first time, readers could see the colors of the birds and animals pictured in the magazine, the colors of wildflowers carpeting the state parks. Over the decades, as technology in photography and printing advanced, stunning outdoor images became a hallmark of Texas Parks & Wildlife magazine. This no doubt inspired many people to venture into the outdoors. State parks were now prominent in the editorial mix. More changes were on the horizon. Texas itself was undergoing major changes in the 20th century, as David Baxter, magazine editor from 1977 to 1998, explains. “With the changing demographics of Texas, and a shift from a rural to an urban state, we worked to instill in our readers a love and understanding of the outdoors they probably did not have growing up in modern Texas compared to their more rural forebears of the 1940s,” Baxter says. “We did this by stretching our editorial scope to include the modern hikers, bikers and park visitors. Nor did we neglect, in my opinion as a hunter, our traditional audience of hunters and anglers. Baxter regularly received complaints from hunters about not enough hunting articles and from non-hunters about too many hunting articles. He responded to each complaint with a similar message: “Over a year’s worth of issues, we cover most all aspects of the Texas outdoors — hunting during the traditional fall and winter months; state parks, hiking and camping when seasonally appropriate." Work by freelance writers and photographers began appearing in the magazine’s pages during the 1980s. To pay the expenses of adding freelance talent, the magazine initiated mail offers to expand circulation, expanded single-copy newsstand sales and increased advertising outside of the small, classified-type ads that ran in the back of the book. Gov. Ann Richards shared her thoughts on the magazine’s 50th anniversary in 1992. The 21st century unfolded at Texas Parks & Wildlife magazine with a special issue titled “The State of Water.” For an entire decade — 2002 to 2011 — the magazine focused the July issue each year on Texas’ various water resources and their future, which Executive Director Carter Smith calls “the defining natural resource issue in this state.” Five companion videos accompanied the series, which culminated in a “town hall” on the state of water at the Bob Bullock Texas State History Museum in Austin. In 2015, the magazine introduced a new delivery system for readers — an app that can be downloaded to a smartphone or tablet for convenient reading anywhere and anytime. Carter Smith was a fan of Texas Parks & Wildlife long before he took the reins as executive director of TPWD in 2008. He now writes the At Issue column each month. Smith explains how the magazine has continued to honor the original goal of introducing readers to the invigorating influence of the out-of-doors to cleanse their spirits and temper their character. Looking toward the future, Smith sees a magazine that will continue to be relevant as it fulfills its original mission. “As we look to the next 75 years, we will undoubtedly seek to update the look and feel of the magazine, to contemporize it and make it more accessible, both visually and digitally, in ways that we likely can’t even imagine,” he says. “And, as our state continues to grow and diversify, we will do all we can to make it as appealing and engaging to as many readers as possible. Mary-Love Bigony is a former managing editor of Texas Parks & Wildlife magazine. She retired in 2004 after 27 years with the magazine, having written 154 stories and edited countless articles.